Are you a 200 hour qualified yoga teacher who wants to deepen in your practice, and in your teaching? Do you want to engage directly with the yoga of wisdom (Jnana) and the yoga of devotion (Bhakti) nestled by the sacred waters of the Holy Ganga? In this 100 hour Yoga Alliance certified advanced teacher training for women, you will discover a rich and deep feminine way of embodying the practice of authentic yoga. Supported by special guest teachers who are experts in their field, there will be daily satsang with Jnani masters plus deep vinyasa yoga, pranayama, meditation, fire ceremony, women’s rituals, devotional kirtan, and sacred dance. This emphasis will be about discovering the beauty of these practices, while letting go of intellectual study, ‘efforting’, and adding more techniques, opening a warm, heartful appreciation of life and a love of yoga that can be integrated and tasted in every moment. The training will take place on the banks of Ma Ganga at the renowned Parmarth Niketan Ashram in Rishikesh. Sessions will be held both inside the ashram and outside in nature alongside the river, sacred caves, temples. We will be visiting the masters who reside in Rishikesh, such as Mooji and Shanti Mayi and looking at the mystical poetesses from India and Kashmir. 20.00 - 21.30 Devotional Kirtan, Sacred Dance, Women's Ritual, or Meditation. Tiffany (E-RYT 500, RPYT) is a radiant Yogini, an Ayurvedic Practitioner and a lover of life who is known for bringing her clarity, abundant energy and aspiration for revealing truth into everything she shares and offers. A world citizen and sacred activist, she approaches life with an open heart and an inspired mind. 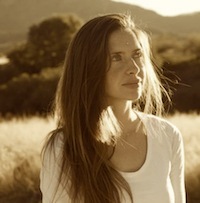 Tiffany has studied and submerged herself in extensive solo and guided retreats with her beloved teachers in India and around the world, immersing herself deeply into Advaita, Tantric Hatha Yoga & Ayurveda. Her students appreciate her art of drawing upon the wisdom of these approaches to offer their truths in ways that are both accessible and highly applicable.